Pam Pearson, Assistant Professor of Education, reading The Sixth Extinction: An Unnatural History, by Elizabeth Kolbert. 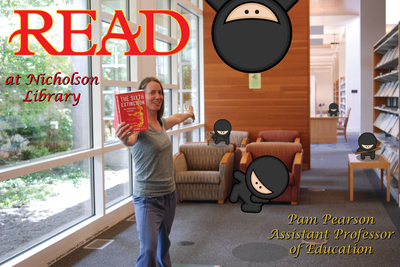 Armstrong, Lige and Nicholson Library Staff, "Pam Pearson READ Poster" (2015). READ Poster Gallery. Image. Submission 143.